Because Kirkus deadlines don’t stop for Thanksgiving, I decided to write about a book I thought might be a fitting Thanksgiving read. And that would be Isobel Harris’ Little Boy Brown, illustrated by French graphic designer and illustrator André François and originally published in 1949. My thoughts on that book are here, and next week I’ll follow up with some art from it (though one illustration, which is also the cover illustration, is pictured right). Today, I’m giving some attention to board books, since those poor guys don’t really get enough attention (at least compared to picture books and novels). I’m chatting with the publishing director of Abram’s Appleseed Books, Cecily Kaiser, about board books and what makes a good one. That link is here. Lastly, this week for Picture Book Month (which is coming to a close), I chat with podcaster Katie Davis about picture books. I might just ramble a bit about Uri Shulevitz, Maurice Sendak, Barbara Bader, Katherine Paterson, Harry Allard’s and James Marshall’s Grandfather Stupid, picture books as “acts of mischief” (as Patricia Lee Gauch describes it), favorite picture books of 2013, and more. Thanks to Katie Davis for dealing with my low-tech old-skool phone skillz. LITTLE BOY BROWN. First American edition published in 2013 by Enchanted Lion Books. Copyright © 2013 by Enchanted Lion Books for this reprint edition. Illustration reproduced by permission of the publisher. and told the men who were escorting him to stay behind. 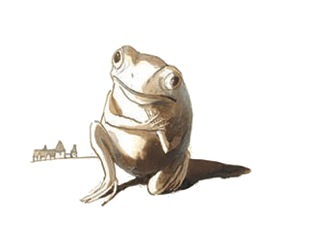 Since I wrote here last week at Kirkus about a new collection of fairy tales from The Brothers Grimm, illustrated by Lisbeth Zwerger and published by Minedition—it’s called Tales from the Brothers Grimm, and it’s beautiful—I’ve got some art from it today. But I’ve got another treat. 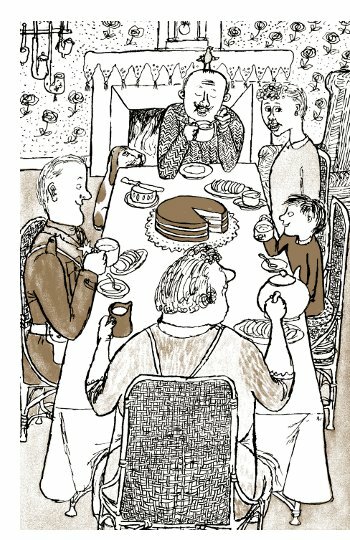 Also from Minedition this December will be The Brothers Grimm’s Hansel and Gretel, illustrated by Sybille Schenker and adapted by Martin West. Now, to read about it, you can go here to Kirkus‘ starred review. (Yes, I’m kickin’ it over to them, ’cause I have a giant stack of work giving me the skunk eye.) They call it nothing less than “gorgeous” and “sumptuous.” It really is both things, more of a coffee-table book than one you want to give, say, a toddler — given things like its thick cover stitching, die cuts, and vellum pages. The stark, black silhouettes throughout the book set a splendidly eerie tone, and the highly-patterned color illustrations that appear (not pictured below) are striking. Below is some art from that book, too. 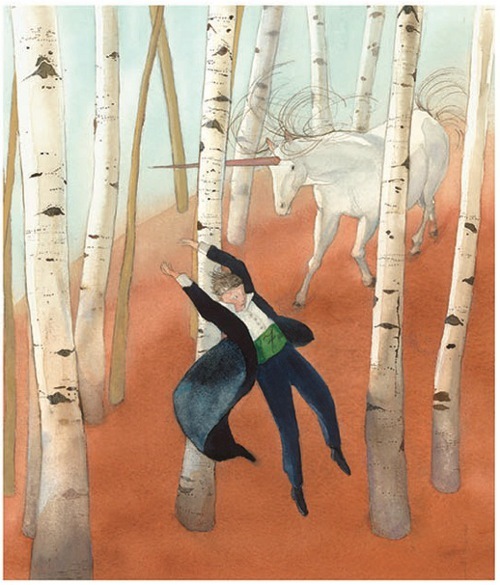 Those of you who follow the wonderful blog Calling Caldecott over at the Horn Book site will recognize today’s book, since they recently posted about it. In fact, I first read about it over there and felt inspired to feature it here. Puerto Ricans looked up and saw that their iguacas were almost gone. 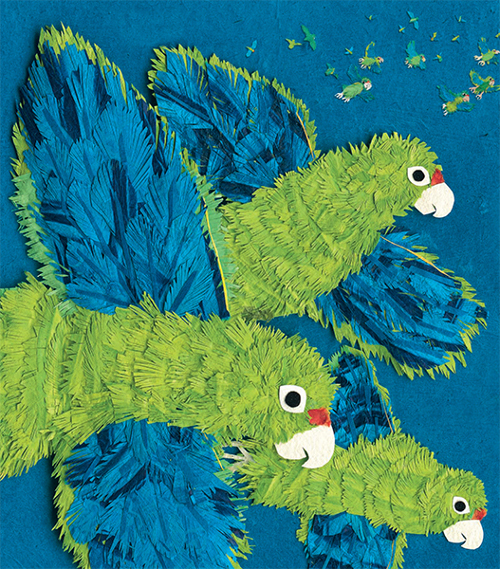 People had nearly caused the parrots to become extinct. Now people started to help the parrots stay alive. This is how most of her fans, including me, respond when they hear she has a new book out. My Kirkus column today is about that and is here. Last week (here), I wrote about Rachel Isadora’s newest picture book, Old Mikamba Had a Farm (Nancy Paulsen Books, October 2013). I’m following up with some illustrations from the book today, including the one pictured above. 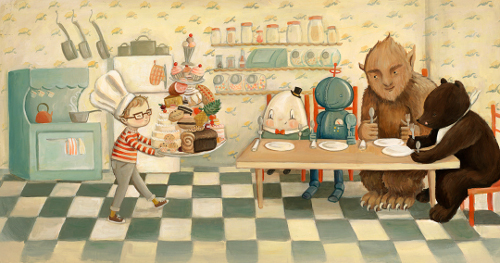 I don’t know about you, but I could look at the illustrations of Lauren Castillo all day. So, I’m happy this morning to have some artwork from her here at 7-Imp. It’s a quick art stop today with two spreads here from Inga Moore’s Captain Cat, released last month from Candlewick. I reviewed this one over at BookPage. That link is here. Today, I just wanted to share a bit of art as a follow-up to the review. I enjoy Moore’s picture books. CAPTAIN CAT. Copyright © 2013 by Inga Moore. Reproduced by permission of the publisher, Candlewick Press, Somerville, MA on behalf of Walker Books, London. Mmm. I want some of what they’re having for breakfast. Hi, all. I’m doing one of those BookPage numbers today. 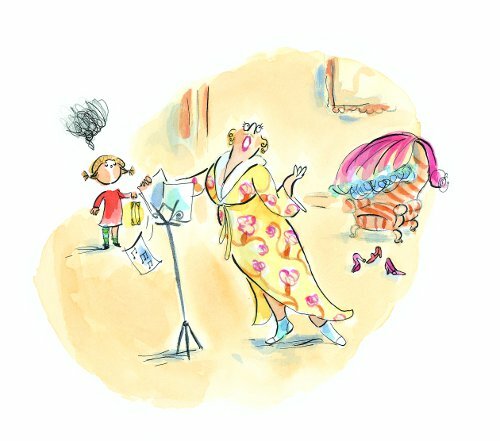 What I mean is: I reviewed a new picture book over at BookPage, and I could just leave it at that. 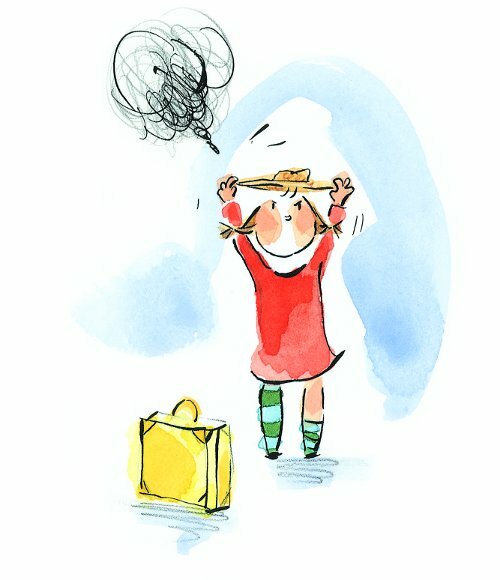 But you all know I get kind of twitchy when I don’t share art from the books about which I write, so I always follow up those BookPage reviews (and my weekly Kirkus columns) with art and (if I’m lucky) sketches from the books — over here at 7-Imp, that is. It’s just an extra, Art-Fan step for me—no one asks me to do it, but I just can’t help it—so humor me. The book I reviewed is Emily Winfield Martin’s Dream Animals, published by Random House in October. 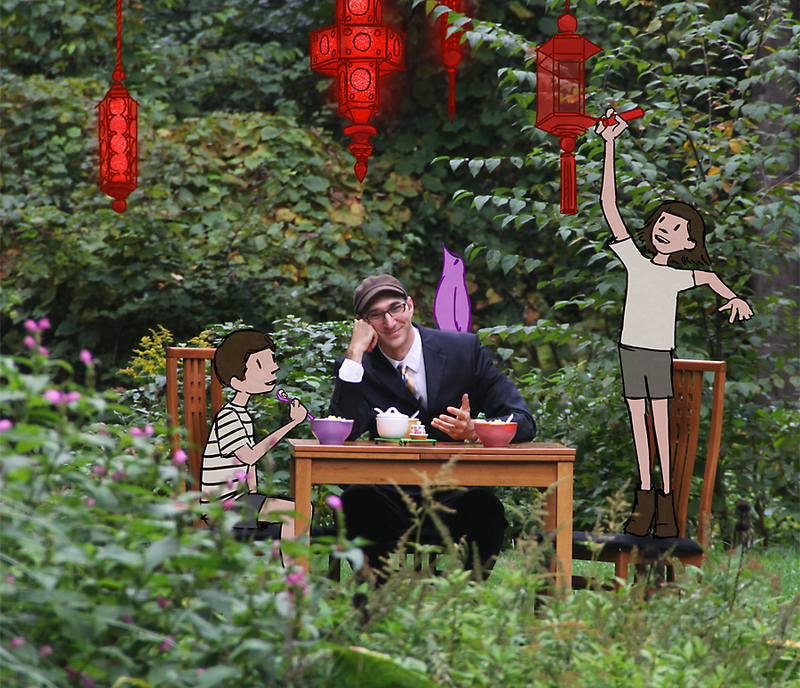 So, to read all about it, head over here to BookPage’s wonderful site. And then come back here, if you’re so inclined, to take in the sketches Emily’s sharing, as well as some final art from the book. 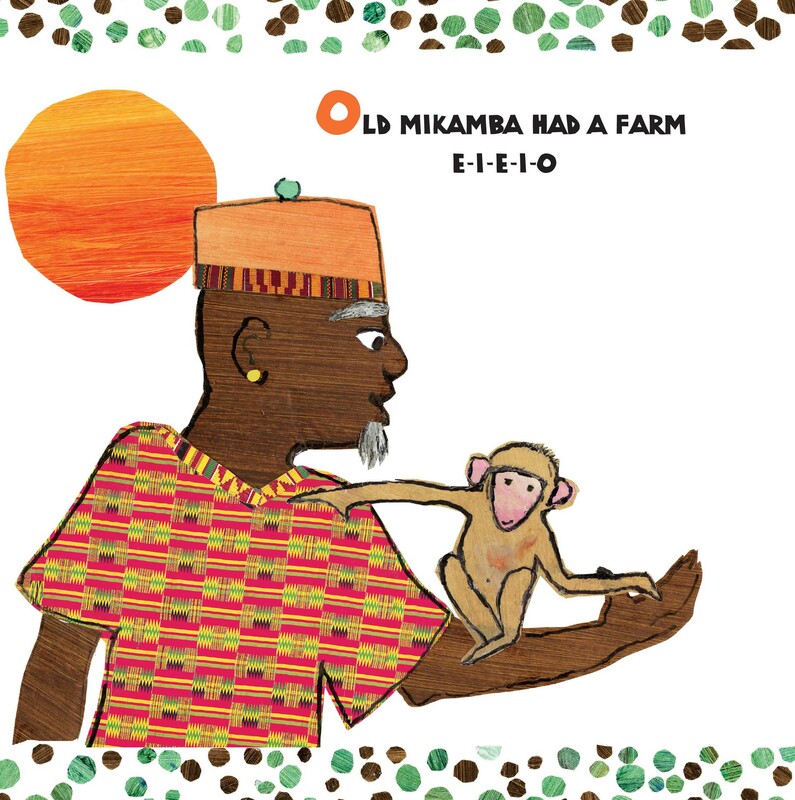 This morning over at Kirkus, I have some thoughts on Rachel Isadora’s newest picture book, Old Mikamba Had a Farm. 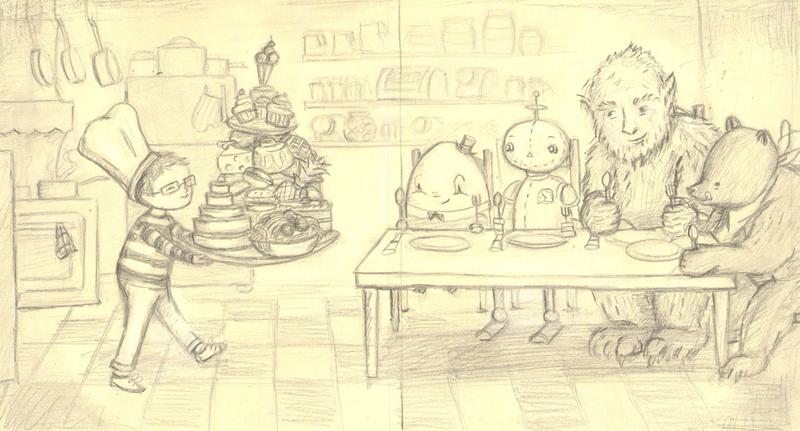 Next week, as always, I will have some art from it here at 7-Imp. That Kirkus link is here. 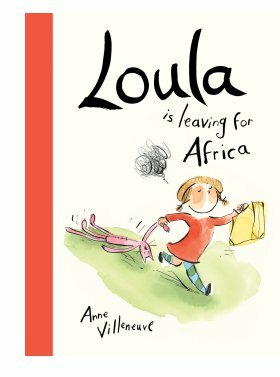 Last week, I wrote about the latest picture book from Canadian author/illustrator Anne Villeneuve, Loula is Leaving for Africa (Kids Can Press, September 2013). Here today at 7-Imp (above) is a bit of art from it. LOULA IS LEAVING FOR AFRICA. Copyright © 2013 by Anne Villeneuve. Illustrations reproduced by permission of the publisher, Kids Can Press, Toronto. 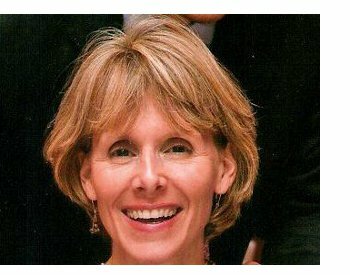 It was a pleasure to chat with author Kate Banks, pictured here. My brief Q&A with her is posted over at Kirkus this morning. 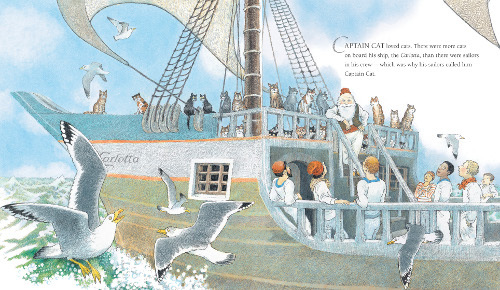 Kate’s newest picture book is City Cat, illustrated by Lauren Castillo, so I asked her about that book. But since Kate’s first books were published in the 1980s, I thought I’d also ask her how she thinks the picture book fares today. Part of her response is above. And all the rest is here. Next week here at 7-Imp, I’ll have some of Lauren’s art from City Cat. Photo of Kate Banks used with permission. Aaron is having a good year. If you follow picture books closely, you’ve probably already noticed this. Journey, his debut picture book, was very recently named one of the New York Times’ Best Illustrated Children’s Books of 2013. 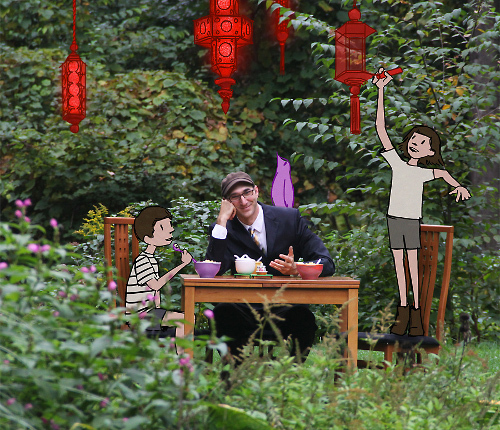 In fact, he just illustrated a special cover for yesterday’s children’s issue of the New York Times Book Review. 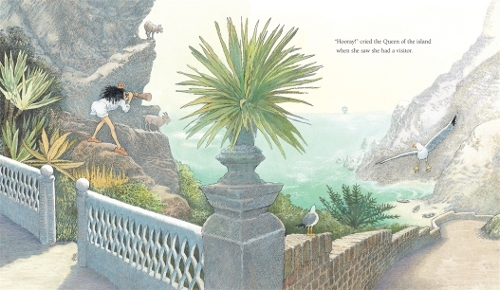 Journey has also been met with glowing reviews all around (mostly starred reviews), has been awarded the 2013 platinum “Best Book Award” by the Oppenheim Toy Portfolio, was nominated for Best Picture Book in the Goodreads Choice Awards, has been garnering Caldecott buzz, and was called nothing short of a “masterwork” by Sarah Harrison Smith in the New York Times. Back in August, when I chatted briefly with Aaron about this book over at Kirkus, I shared that I found myself with a very early copy of Journey after this post from last year when I sort of stumbled upon Aaron’s artwork and website. 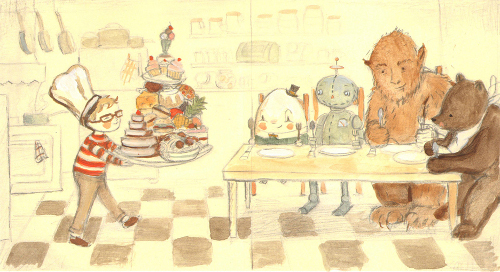 I loved it so much that one morning I, no kidding, called an emergency picture book coffee-shop meeting with two friends who love picture books as much as I do, ’cause I just had to show them this book. We sat over our cups of strong coffee and ooh’ed and aah’ed a lot. And I still think it’s special. Even though we’ve had that short Kirkus chat this year, I still wanted Aaron to come over for a 7-Imp breakfast, ’cause 7-Imp breakfasts mean we see way more art.